Dark Lord is back for his fourth game – and a crack at solidifying his TOC potential. Given that, I’m guessing Dark Lord will push all his chips to the middle. The other players should follow suit to cover him. We’ll go through the calculations anyway. If Amy doubles her score, she’ll have 27,200. 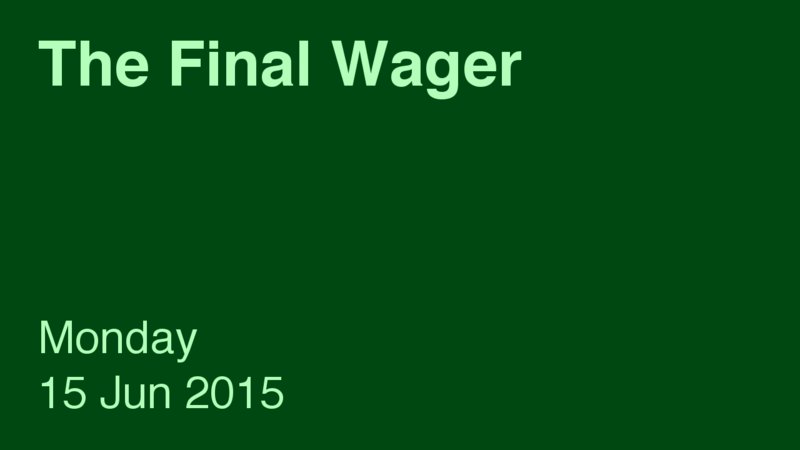 To cover this all-in wager, Brennan will need to wager 8,200. An incorrect response with that wager will leave Brennan with 10,800. To stay above his total, Amy can wager up to 2,800. Dark Lord can wager up to 2,200. A successful doubling will put Dark Lord at 26,000. To cover this, Amy should wager at least 12,400. In this case, though, she will lose on an incorrect response, so she might as well wager everything. If Amy makes the rational maximum wager of 2,800, Brennan will need to wager 2,600 to stay above her. Probably not a good move here. In that case, Amy would have to wager 8,000 and respond correctly, but she’s already got a logical all-in range. Dark Lord might consider risking at least 8,600 (read: everything). Amy could cover Dark Lord with a smaller range, if she’s willing to take the risk. Dark Lord should cap his wager at 1,000. Dark Lord’s reign comes to an end, but not before he takes home $63,000. Great work! Brennan came to play, though, amassing that total without the benefit of a Daily Double. We’ll see how he does tomorrow! Just FYI: Dava-Leigh Brush is currently sitting in 1y place on the TOC Standings.